Jennifer Forsythe laughs when she has to explain, once again, how to pronounce her field of study. Simply stated mycorrhiza (pronounced my-kor-eye-za) is the study of a relationship between a soil fungus and the roots of the plant it grows on. Mycorrhiza is described as one of the oldest known symbioses on earth. Essentially, the plant gives the fungus carbon, which in turn transfers inorganic nutrients from the soil back to the plant. This gives the plant many competitive advantages, including pathogen protection and drought tolerance. Forsythe explains that mycorrhiza can also have an impact on plant health, and can affect the diversity and productivity of the entire plant community. 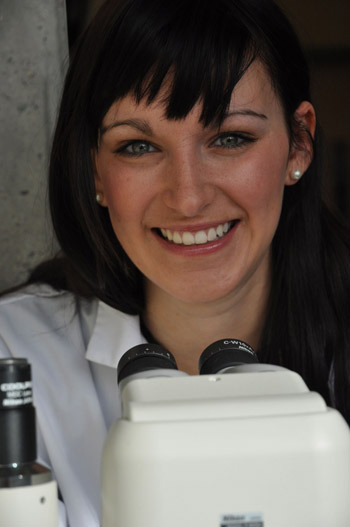 Forsythe, a master of science student in Biology at UBC’s Okanagan campus, knows her stuff. While she spends much of her time peering into a microscope, in January she travelled to India to participate in the Seventh International Conference of Mycorrhiza. There, she presented her research to an audience of experts in the field and won the top student prize for her work. At the conference Forsythe’s presentation entitled A Field Study of Specificity in the Arbuscular Mycorrhizal Symbiosis won the prestigious John L. Harley Medal for excellence. The John L. Harley Medal is awarded at each International Conference on Mycorrhiza to the graduate student who presents research that emulates the rigorous approaches to mycorrhizal research that Harley pioneered. It is the most prestigious award for a student to win at the conference. Her goal going into the conference was to make her presentation different from the hundreds of PhD students she would be competing against. Her storytelling method worked. After her presentation one of the judges sought her out in the crowd to express his delight in her work. That gave her a hint, despite the fact that she was competing against a large group of mostly PhD students that she did well. With the first-place finish, Forsythe won a small cash prize, the medal, a certificate, and, most importantly to Forsythe, international recognition from the scientific community. Klironomos and UBC Okanagan Prof. Melanie Jones, current president of the International Mycorrhiza Society, were also at the conference in India. The Okanagan campus has four research labs, all in the Irving K. Barber School of Arts and Sciences, which work on different aspects of mycorrhizae. This is the highest concentration of researchers on this topic at any university in the world, adds Klironomos. Considering the conference meets only every three years and the top scientists in the field are among the judges, it really was a feather in Forsythe’s cap. As a graduate student she will defend her research this summer, and the win in India has given her a boost in confidence.